the occasional company of his recalcitrant teenage son and an aging Labrador, both at the discretion of his ex-partner Julia. It's picturesque, but there's something darker lurking behind the scenes. Jackson's current job, gathering proof of an unfaithful husband for his suspicious wife, is fairly standard-issue, but a chance encounter with a desperate man on a crumbling cliff leads him into a sinister network-and back across the path of his old friend Reggie. Old secrets and new lies intersect in this breathtaking novel by one of the most dazzling and surprising writers at work today. Kate Atkinson's first novel, Behind the Scenes at the Museum, was named England's Whitbread Book of the Year in 1996. Since then, she has written ten more ground-breaking, bestselling books, most recently Transcription. She lives in Edinburgh, Scotland. 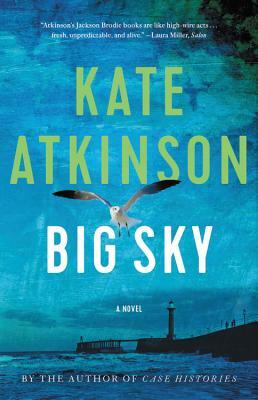 "We marvel at Atkinson's rare ability to create in a relatively few but stunningly deft brushstrokes at least a half-dozen characters with the depth and complexity to own their own novel. Another dazzler from a writer whose talents know no bounds."